Honolulu Eye Doctor Jeffrey Maehara, M.D. 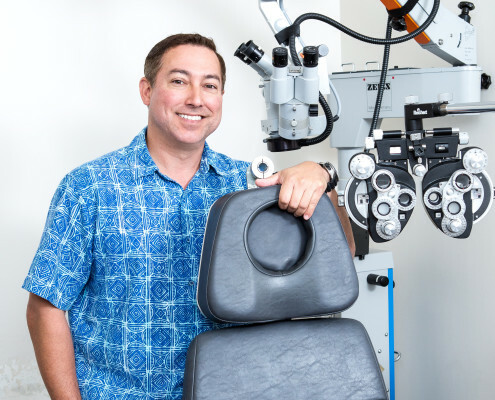 You are here: Home / Honolulu Eye Doctor Jeffrey Maehara, M.D. Eye doctor Jeffrey Maehara was raised in Honolulu. He attended Tulane Medical School at Tulane University, in New Orleans, Louisiana. At Tulane, he studied under three of the world’s top LASIK and refractive surgeons. He is board certified by the American Academy of Ophthalmology and is a fellowship-trained Anterior Segment-Glaucoma Specialist. This double-subject training has given Dr. Maehara extensive experience with complex and advanced glaucoma management, LASIK, cataract and corneal transplants, and other refractive procedures. He brings this experience to the Islands. As an ophthalmologist, Dr. Maehara focuses on leading the way with new technology. Years ago, he implanted the very first AcrySof ReStor premium lens in Hawaii. That lens has grown to the nation’s #1 implanted premium cataract surgery lens. He also was the first to routinely offer AquaLase technology – the gentle “wash away” your cataract technique. Likewise, he implanted the first astigmatism-correcting Acrysof Toric cataract lens, performed the first non-penetrating deep sclerectomy with Aquaflow implant, and the first Canaloplasty in Hawaii. Beyond his experience as an ophthalmologist, Dr. Maehara also practices preventive and integrative medicine as a fellowship-trained, anti-aging regenerative medicine physician. He is an active member of the American Academy of Anti-Aging Medicine. He is the owner and medical director of BodyLogicMD of Honolulu, the nation’s fastest-growing physician providers of health, nutrition, fitness and bio-identical hormone replacement therapy. Find out more about Hawaii bio-identical hormones and BodyLogicMD at www.BodyLogicMD.com. In his free time, Dr. Maehara is an avid fisherman, hunter, and ocean enthusiast.